Serving Time: Noon to 4:00 p.m.
One of the ways ForColumbia strives to love and serve our neighbors is by serving those non-profit organizations who are actively working every day in the lives of people in Columbia. One of the organizations in our city with the greatest reach is The Food Bank for Central and Northeast Missouri. This organization hosts an annual event called Float Your Boat as its premiere fundraiser to help provide food to those in need. Volunteers help make this annual fundraiser a success, and this year, ForColumbia is providing those volunteers! It will be a fun and rewarding day spent serving at Float Your Boat. Some volunteers will be carrying boats in and out of the water. More detailed instructions will be given by leaders of this event prior to the 27th. You should show up prepared to get at least somewhat wet. We encourage you to consider bringing rain or wading boots. 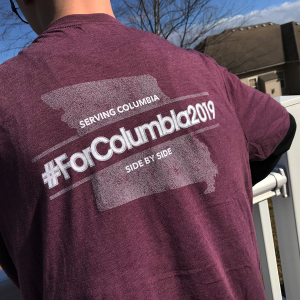 Please be sure to wear your #ForColumbia2019 T-shirt! Yes, older elementary children can serve at this event alongside an adult.